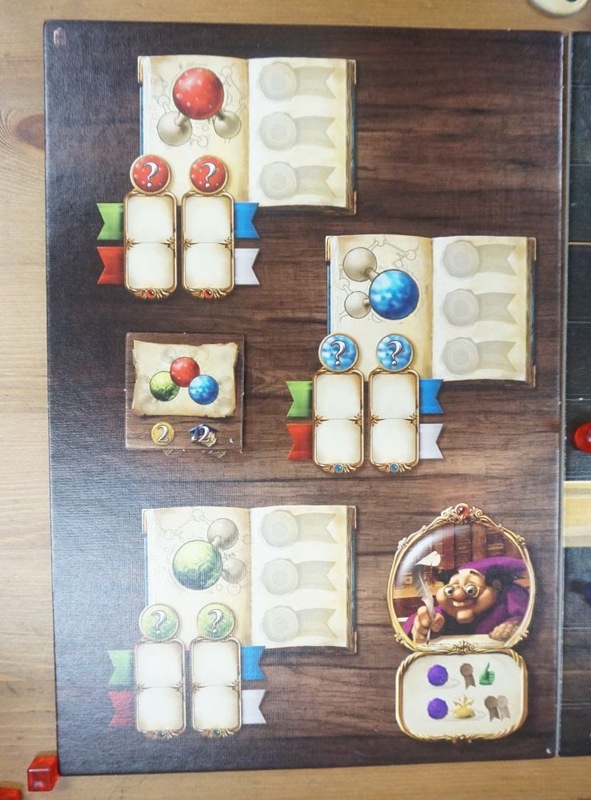 Alchemists is a 2014 game. 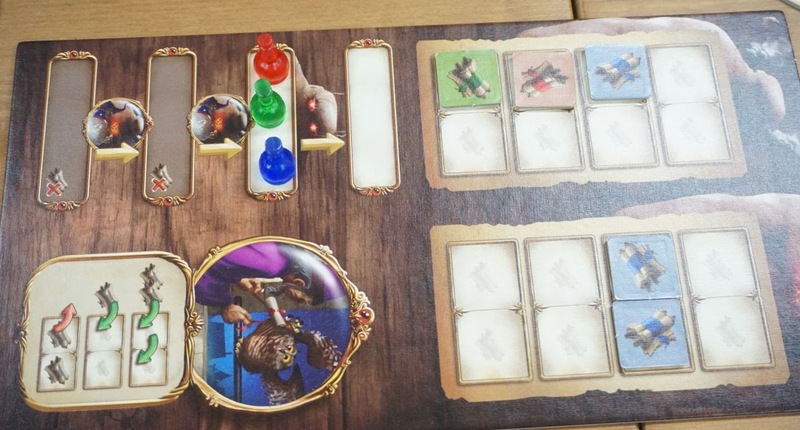 It is a deduction game with an unusual setting. I played it once a few years ago, and at the time was tempted to buy a copy. 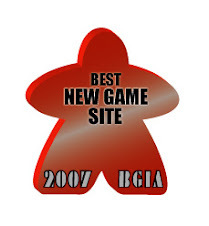 I didn't, and after that first play, never revisited it until recently when Ivan brought the expansion to Boardgamecafe.net. The expansion is called The King's Golem and it contains a few modules. We played with all modules added. This is the king's golem. Players now have a new type of action - working on the golem. You can experiment with the golem, to see which ingredients trigger what responses from the golem. An ingredient may cause the golem's ears to smoke or its heart to warm, or both, or neither. Ultimately you want to discover which specific combination of two ingredients animates the golem. As you experiment with the golem and learn more about it, you may submit progress reports to the king, which gives you some benefits. When you feel confident that you can animate the golem, the king will grant you access to it. If you succeed you will be handsomely rewarded. If you fail you will be ridiculed. 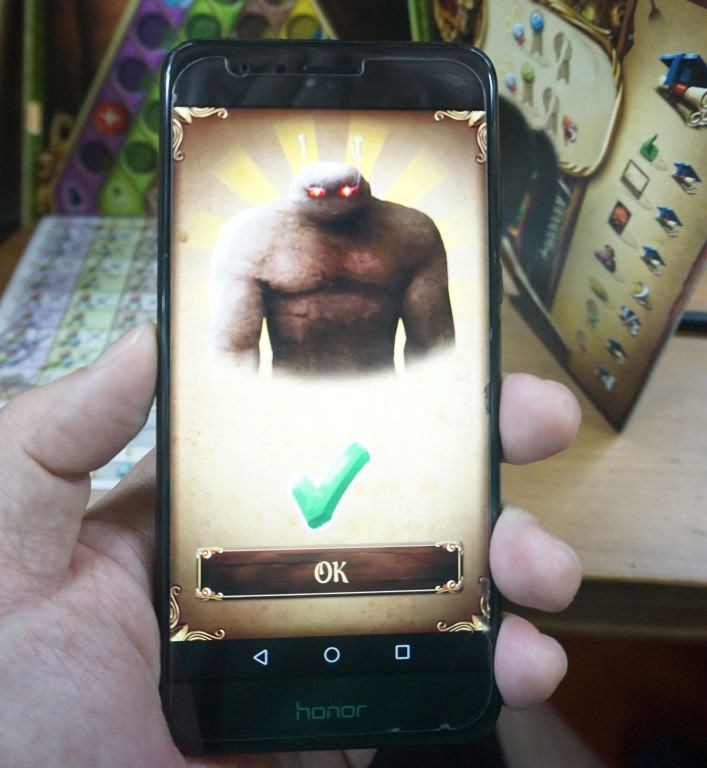 You need to use the mobile phone app when you attempt to animate the golem. This screen above is shown when you successfully animate the golem. You need to use a new deduction sheet. Notice the sun and moon icons along the two sides. Now every ingredient has a new property - day or night. As one of your actions, you may spend a king's favour (a new resource) to visit the royal library. At the library you may study one specific ingredient and learn whether it is a day or night ingredient. This eliminates four of the eight possible alchemical component combinations. At the bottom there are three new sections, all related to the king's golem. The first section is for recording your experiments on the golem. You record whether an ingredient causes the golem to smoke or warm. It is the component of a specific colour and size which causes the golem to smoke, and another component which causes it to warm. So the next new section is for deducting which specific components do these. 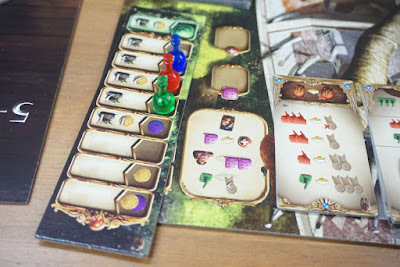 Once you know the two specific components, you can work out which two ingredients animates the golem, because only two of the eight ingredients in the game contain those two specific components. 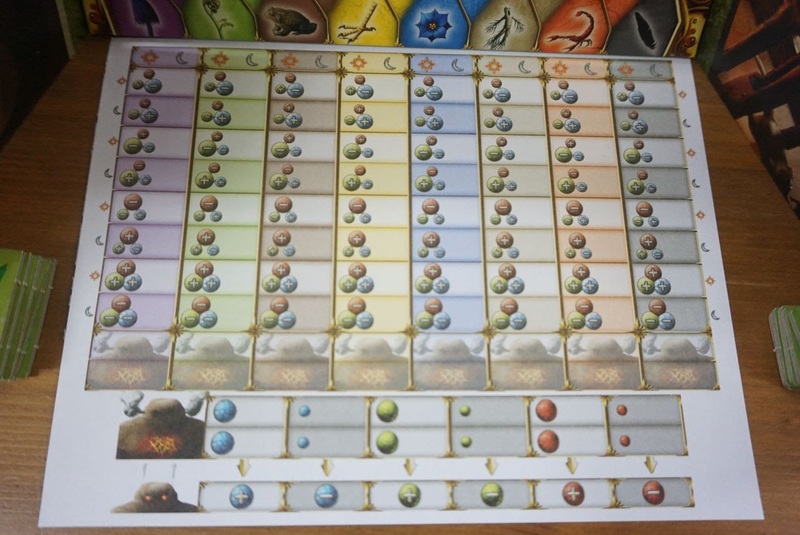 This new board is for golem studies. At the start of the game you place your player marker at the bottom left. Each time you perform an experiment on the golem, you advance to the next level. At the second level you qualify to submit progress reports to the king. To advance to the third level, you need to successfully animate the golem. When you submit a progress report, you have three options, as specified at the bottom right. Let's look at the next photo to explain these. The first type of progress report is when you state two possible components which make the golem smoke or warm. In this photo the blue player has submitted such a report. The two face-down tiles belonging to the blue player specify two components which may make the golem warm. The second type of progress report is when you are absolutely sure which component makes the golem smoke or warm. 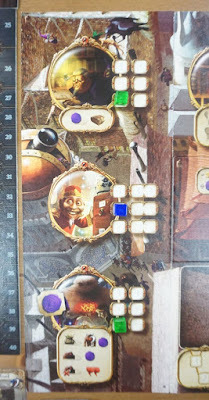 In this photo all three players feel confident about which component makes the golem smoke. The third type of progress reporting is when you amend a previously submitted report which contains two components. You remove one of the components, i.e. you are now sure which of the two actually triggers the response from the golem. At the end of the game, all reports are scored. Single component reports get the most points, but also get the highest penalty if you are wrong. Dual component reports get fewer points, and the penalty for being wrong is also smaller. Since you can't see what your opponents have submitted, watching what they do on this board usually doesn't help you deduct. 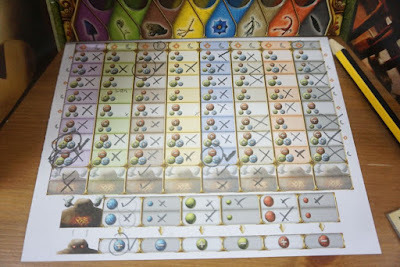 This is another expansion game board. These are a new type of theory you may publish. In the base game, publishing theories is done based on ingredients. In the expansion, you may publish theories based on components. If you feel confident about a component of a specific colour, you may publish a theory claiming which ingredients contain a positive or negative signed component of this colour. One big difference is to publish a theory based on components, you need to spend a king's favour. Normal publications require cash. Otherwise, publishing works the same way. You gain reputation (points). You lose reputation if your theory is debunked or it is found to be wrong at game end. You get a grant when you publish enough theories. 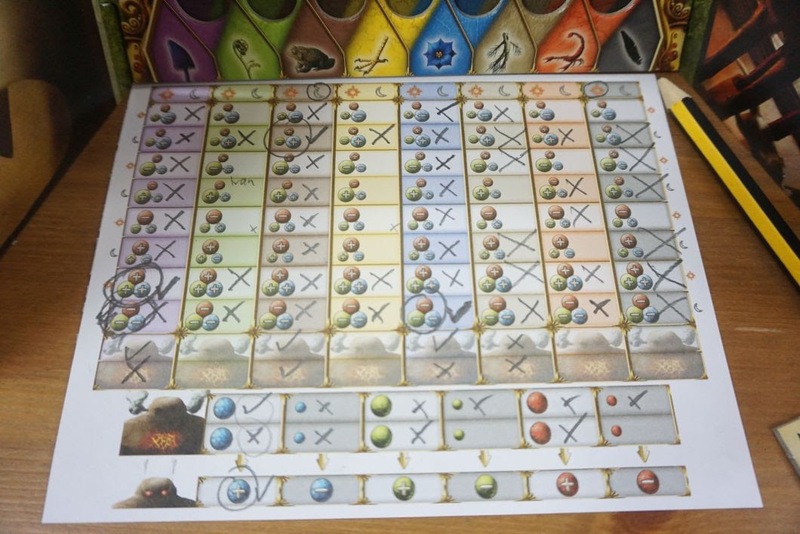 This is an extension of the main game board. There are two new groups of actions, at the top and at the bottom. The top section is related to visiting the royal library, as mentioned above. The bottom section is related to working on the golem. The purple icons are the new resource - the king's favour. The middle section is the merchant, which already exists in the base game. However there is a small change. Instead of three artifacts on offer per stage, you now have four. The fourth one requires the king's favour as part of the payment. These are the starting resource cards. They are a new module. In the base game everyone starts with the same resources. 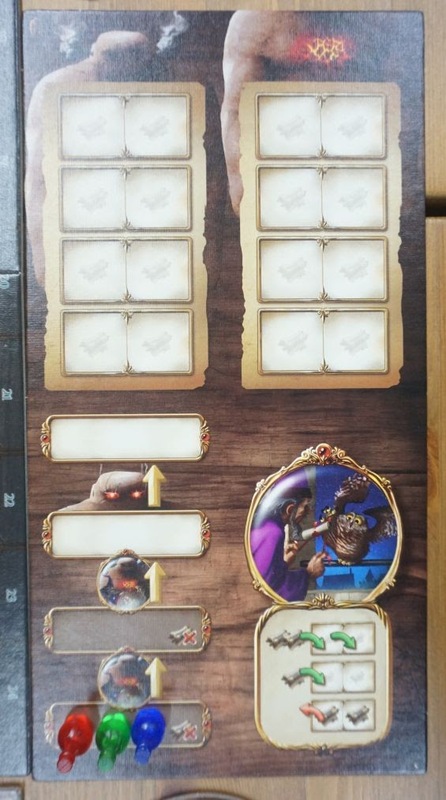 If you use this module, you draw four cards and select two to determine your starting resources. It's a small change, but I like it because it creates variation among players. This is yet another expansion module. 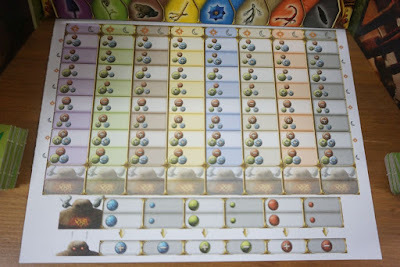 This is the player order table. At the start of a round, you take turns claiming a spot on the table. The spot you claim determines the goodies you get. Some spots require a payment. Once all pawns are placed, the turn order is determined by their positions. When you use the expansion module, every round a different player order table is used, giving different types of goodies. This is also a simple change. It injects some uncertainty and variability. It had been a long while since my previous play, and I had forgotten most of the strategies, so I decided to play with a simple mindset. I just wanted to enjoy the deduction process. I neglected the money game, which meant ignoring the artifacts. This is where I need to inject a warning along the lines of "kids, do not try this at home". Ignoring artifacts is certainly not a winning strategy. Artifacts are very powerful when used right. Neither Jeff nor Ivan missed out on them. I was happy with my deductive work. Towards game end I found that I was fairly certain of the components of all eight ingredients. This sounds nice, but it is actually wasteful. I didn't have that much time to publish so many theories. Spending so much effort to learn more than I could score points from was bad. I could only console myself that I did it for science, not for glory. To play effectively, one needs to make efficient use of his resources and time. I spent much effort on the golem too. It was the new and shiny thing so I wanted to experience and understand it. It is quite a complex expansion module and it gives players more depth to explore. What I find amazing is how this module integrates seamlessly into the base game. 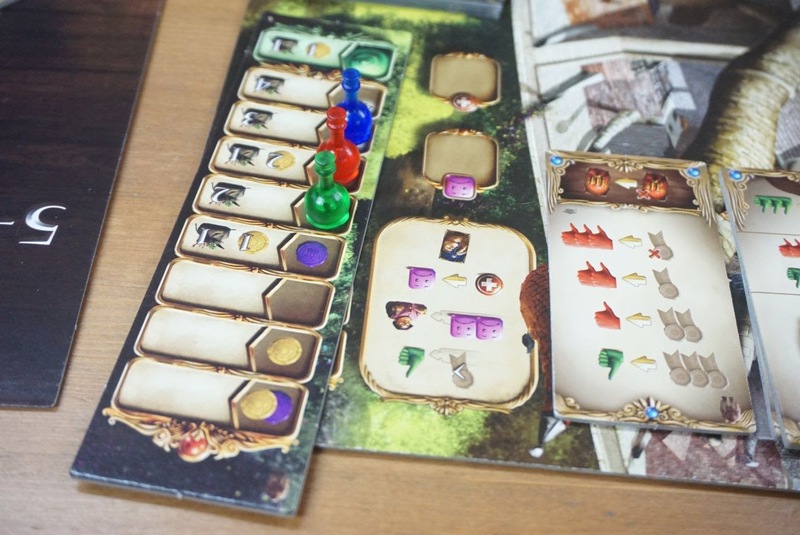 The experimentation you do on the golem can help you in finding out the components of the eight ingredients, and the experimentation you do on the ingredients themselves too can help you figure out what animates the golem. The overall deduction space becomes richer. The golem module feels like part of the family and not an awkward son-in-law. I feel the new type of publication makes the game a little less competitive. I imagine it would be worse with only two players. It might be fine with four. In our game, Jeff only published theories based on components. Ivan and I fought over conventional publishing, but the competition was mild. The deduction in the game continues to be satisfying. It's the same kind of pleasure as uncovering a mystery, or solving a difficult math problem. There is more to think about compared to the base game, but if you enjoy the base game, you are probably fine with this kind of quiet and intense calculation. In our game I decided to just enjoy the deduction and not worry too much about winning. Yes, that's my excuse for doing so poorly in the scoring department. I made two critical mistakes in my calculations. The first one was related to the components of an ingredient. Afterwards when I rechecked my calculation steps, I managed to find where I missed a step. That impacted all calculations beyond that point, ultimately resulting in a wrong theory being published. I lost points after my theory was debunked by Ivan. The other mistake I made was related to the golem. I was first to enthusiastically tell the king I could animate the golem, and I actually succeeded in getting the two ingredients right. However at the end of the game, I found that I had reversed the two components which caused the golem to smoke and to warm. Despite being able to animate the golem, the king was rather upset at my two incorrect progress reports, and I lost much face at court. Only one word described my final score - horrible. When I rechecked my notes on the golem, I found that I had recorded one of my experiment results incorrectly. An ingredient which caused the golem to warm was recorded as having caused it to smoke. No wonder my progress report was wrong. This is a game where you need to be meticulous and careful at every step, because many deductions depend on the previous steps being right. One misstep and your whole theory unravels. I was quite confident and my deduction sheet was almost full. Unfortunately being confident didn't necessary mean being right. The King's Golem is meant for those who have already played much of the base game and want to extend the replayability or want some variability. If you have not played the base game, do not add this expansion. The base game itself is already quite rich. Some of the small additions in the expansion are, strictly speaking, non-essential. However for long-time players, the variability will be welcome. The golem module is quite a big and complex addition, and is not recommended for new players. 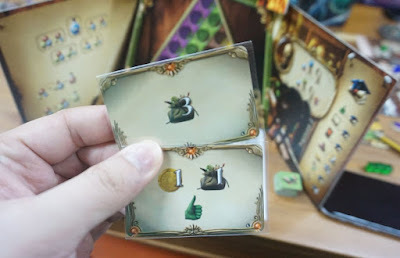 Once you are familiar with the base game, you will appreciate how seamlessly this module combines with the original mechanisms. I am certainly impressed.